The power of love stories comes from many different cultures. Sometimes we forget it’s not all just Regency romances, popular modern erotica made famous (ahem! “50 Shades of Grey”), or contemporary chick-lit. “Love Comes Later” by Mohanalakshmi Rajakumar is a new, modern love story of cultural differences, friendship and a discovery of love that risks its boundaries. This modern tale begins in Qatar with Abdullah, a young husband and soon-to-be father whose world falls apart when he suddenly loses his pregnant wife and their unborn child in a car accident. He is heartbroken and racked with guilt, blaming his selfishness and workaholic mindset in not having driven his wife as planned one morning. Inconsolable, he vows to himself to never marry again. 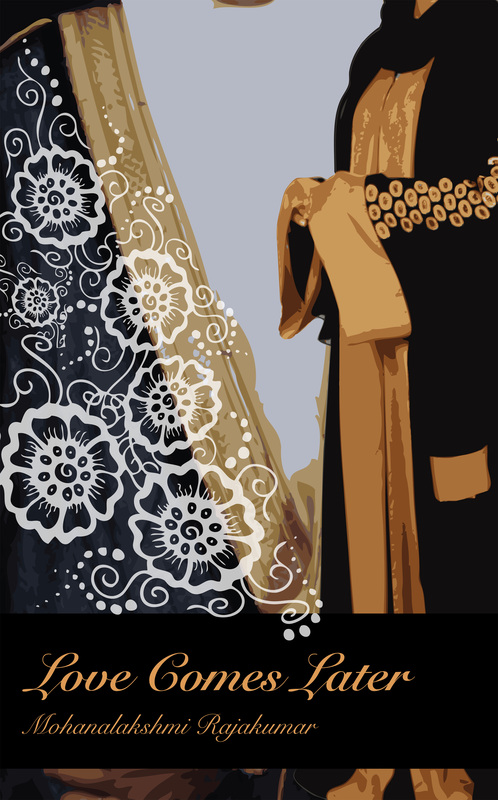 But three years later, Abdullah’s family pressures him to marry again a member of their extended family, as part of their cultural duty and expectations. Hind, is a modern Qatari girl, like Abdullah, highly educated, both their families are wealthy and both are cousins, a perfect match as far as their families can see. But, both are reluctant to get married, let alone to each other for reasons that will never be understood or accepted by the traditions they are bound to. So, Hind plans an excuse to put off her wedding to Abdullah, for one more year, announcing she must finish her Masters degree in London, England. Abdullah agrees, somewhat relieved as well. From here, the story picks up it’s pace, taking the reader to London and begins to take the story to interesting twists and turns different from where you think the story will originally lead them. Hind meets Sangita, an American raised Indian. She is opposite of everything Hind is, confident, independent, forward and very Americanized. They become fast friends after meeting in class and soon become roommates. Their friendship leads them to discover the similarities in each others’ upbringing along with goals and dreams they both hope to achieve one day. As the year approaches near to Hind and Abdullah’s pending wedding, Hind makes a decision one day to take a quick weekend trip to India with Sangita’s brother, Ravi. This sets the course for both women, especially when Abdullah decides to make a surprise visit while she’s gone. Sangita is left to entertain and stall Abdullah, lying to him for Hind’s sake. This unlikely couple instead find a forbidden attraction they both don’t expect and a comfortable rapport with someone they weren’t looking for. 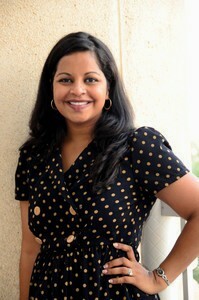 Mohanalakshmi Rajakumar is a South Asian American who has lived in Qatar since 2005. Moving to the Arabian Desert was good in many ways, since that is where she met her husband, had a baby, and made the transition from writing as a hobby to making it her full-time gig. She has published three e-books this year: Mommy but Still Me, So You Want to Sell a Million Copies, and Coloured and Other Stories. Since she joined the e-book revolution, she has dreamed in plotlines. “Love Comes Later” is an enjoyable read that pulled me in from the start. Mohanalakshmi Rajakumar has weaved a realistic story of characters from an exotic, unfamiliar, wealthy country which many may not know much of in the Western World. Abdullah, is literally the perfect, “tall, dark and handsome”, silent brooding male hero that any woman would fall for. Sangita and Hind are the yin and yang to Abdullah’s future. You identify with the characters, the closeness of family, the pressure to marry, friendship that is tested, and the desire to freely choose your own happiness. The beauty of this story is in the details and descriptions of modern life in Qatar and India. Each character is fully realized with the path they choose to follow, regardless of the consequences, regardless of what they stand to lose. “Love Comes Later” brings two people together and tears two friends apart. You find yourself hoping each one of these characters gets what they want. In the end, we find everyone is reaching for happiness that is just within reach, hoping their own choices will bring love, later.